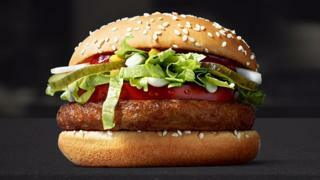 Image caption Sales of the McVegan in Finland have been "promising"
A McDonald's trial of a vegan burger in Finland has cooked up some "promising" results, with sales so successful the company may offer the McVegan nationwide. But people hoping for an animal-free happy meal in other countries will have to wait: the test is specific to Finland. Sales are from 4 October to 21 November at five shops in Tampere, Finland. "The first results are very promising," spokeswoman Heli Ryhanen said. "At the moment at least, it feels like it might be sold nationwide." Fewer than 1% of people in Finland identify as vegan, according to a 2009 survey. But Finland's meat consumption is lower than in the US and many countries in Europe. Ms Ryhanen said the company considers the McVegan the "next step" for its local menu, after veggie burgers were added in 2012. The firm developed the soy patty in Finland, with Finnish tastes in mind, she said. "It was important to have a juicy patty," she said. Making the item permanent will depend on whether sales continue after the initial curiosity. McDonald's and its franchisees run 64 stores in Finland, a relatively small number that eases the ability to introduce new products. The Tampere shops have been used to test menu items before.